Gunung Padang in Indonesia, is the world’s largest and oldest pyramid. Dating back to at least 5,000 BC (and possibly older), the Gunung Padang Megalithic Site is arguably the oldest man-made structure on the planet, predating the Great Pyramid of Giza by at least several millennia. 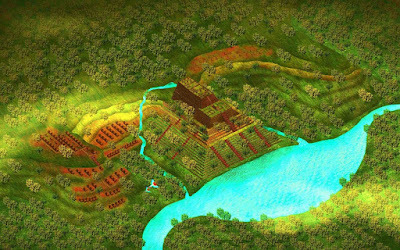 An Artists rendition of an unearthed Gunung Padang. Source. The site was once thought to be a natural hill with megalithic ruins at its peak. 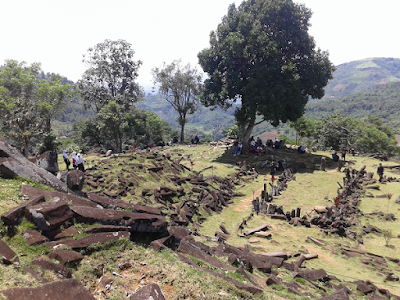 Nearly 100 years after its discovery in 1914, geologist Dr Danny Hilman Natawidjaja speculated that the ruins were really an enormous pyramid which continued far below the stone monuments atop the hill. Further investigation showed that not only was there indeed an intricately designed structure buried within “Gunung Padang,” the structure was outrageously old, dating between 9,000 and 20,000 years old. The very idea of something that old contradicts everything we think we know about “pre-history.” The going theory (although practically every new discovery disproves it,) is that up until 10,000 years ago, we were still hunter-gatherers. Being “hunter-gatherers” means we had not yet learned to farm. This means that we were still wandering nomads and had not “settled.” This also means that we did not build cities. The discovery of a massive man-made structure that is possibly 20,000 years old could quite literally re-write history as we know it. The excavation of the Gunung Padang structure has now uncovered not only an outer stone structure, but internal chambers as well. Buried within this “mountain” we may very well find the halls of an ancient civilization that vanished without a trace. Just a few meters below the soil, we could find in-depth insight into a lost era – a part of our own history that we never even knew existed. For some reason or another, what may be the most important archaeological find of the century remains buried beneath a few meters of soil. The excavation that had begun was halted in 2014 and has not continued since. Why? Corruption? Laziness? Old-school archeologists that have made up their minds and don’t want to be confused by the facts? Probably all of the above. According to this article, a member of the President's staff has admitted to the discovery of some sort of “advanced technology” within the structure. Due to this "very special discovery," Terraces 1 and 2 may be studied by the Ministry of Education, while Terraces 3 and 4 of Gunung Padang have been handed over to the discretion of the President. When the facts don’t fit the theory, we change the facts. But perhaps it’s time to admit that history books are written only on paper. Real history is written in stone. And that is the only history that should be learnt, taught, and believed. 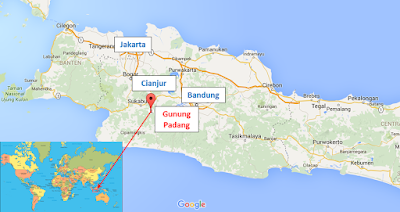 Gunung Padang is located on the island of Java, roughly 130 kilometers from the nation’s capital city, Jakarta. If you’re flying in from overseas, Jakarta would be the most easily accessible airport. Although the city of Bandung is slightly closer, the only international flights are from Singapore, KL and Johor Bahru in Malaysia, and Xi’an in China. A map of Gunung Padang. 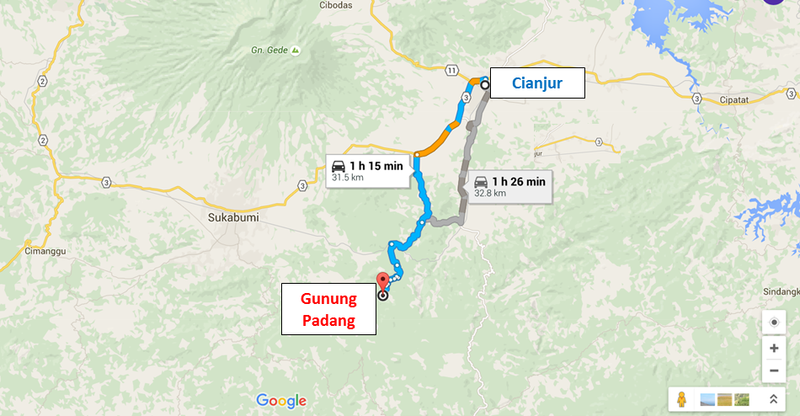 From Jakarta, renting a car is probably the easiest way to get to Gunung Padang. 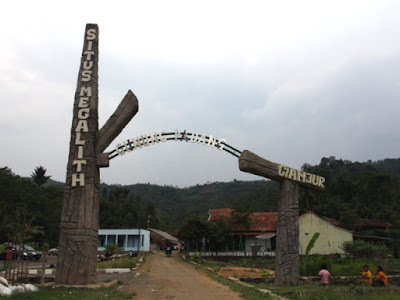 As the structure is roughly 5 hours from Jakarta, we decided to spend a night at a “half-way point” in Cianjur – a small, mountainous village, surrounded by rolling hills and lush green rice paddies. 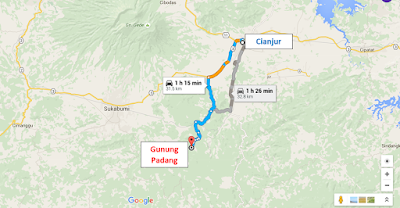 If you are driving from Jakarta, it’s wise to note that the road to Cianjur comes through Puncak. This is a road that only goes one way at a time, alternating directions every 2 hours. If you reach this road at the wrong time, it will be closed, with traffic only coming in the opposite direction. In other words, you’ll have to sit in your car for a couple hours without moving while waiting for the road to open again. In this area, there are not a large amount of hotels which are available for online booking. 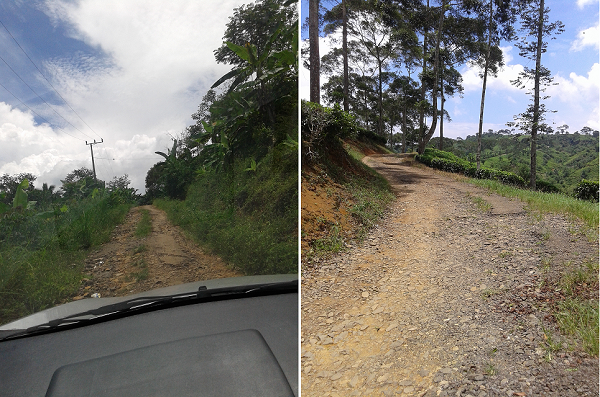 Although you will find plenty in Puncak, bear in mind that Puncak is nowhere near Gunung Padang. In any case, just pop it into Google Maps before booking, so as to not end up on the wrong side of Java. 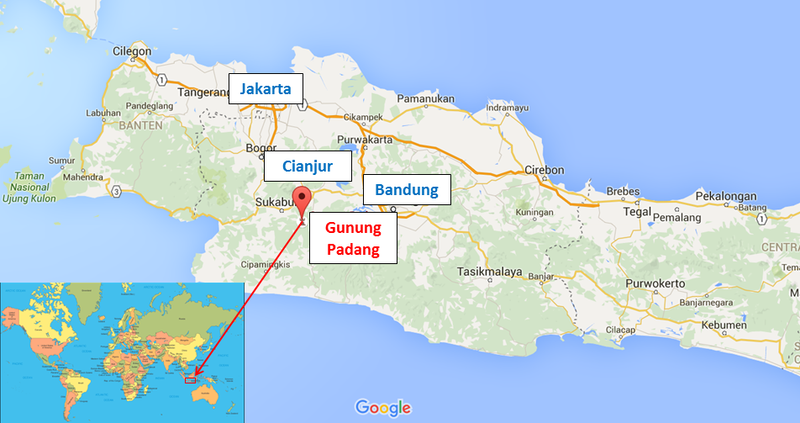 The place we stayed was roughly 30 km from Gunung Padang itself. A lovely view from our hotel room in Cianjur. The next morning, we checked out and set out for Gunung Padang. As much as I love Google and couldn’t live without it, there are times when Google just tells outright lies. Here, our trusty Google Maps provided us with two possible routes. Not wanting to waste time, we chose the route which is about 15 minutes and just over a kilometer shorter. Plotting the way to Gunung Padang. 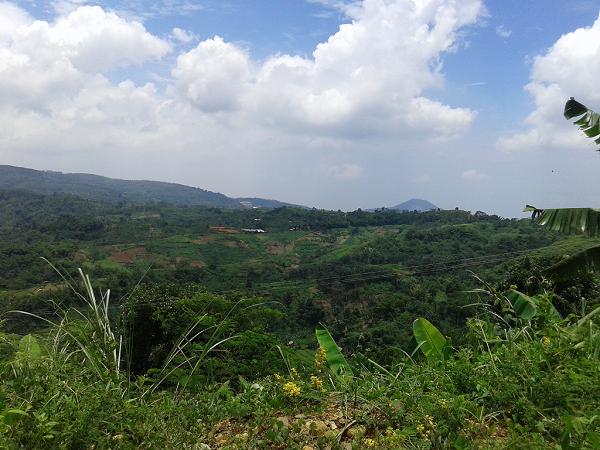 The scenic route to Gunung Padang. By this point, there was no one else on the road, except for the occasional motorbike. (duh, our car could barely keep all four wheels within the boundaries of said road.) No longer was it just a broken down road filled with potholes, but rather a collection of rocks that were put in the shape of the road. Thanks, Google. Welcome to Gunung Padang! Source. At last we made it to the grand Gunung Padang entrance. This is actually roughly where the base of the pyramid is. From here, you can choose to climb about 300 steps to the top of the pyramid, or you can opt to take an ojek (motorbike taxi) to the top. Why do we have to go to the top? Because that’s the only part of it that’s uncovered. Although the ojek will tell you that it costs IDR 5,000 (about USD 0.40) to go to the top, it actually costs IDR 50,000 (about USD 4.00.) After that, you will have to pay an entrance fee of IDR 5,000 (about USD 0.4) once you reach the top. All in all, it’s pretty cheap. Last leg of the journey. We chose the ojek option. 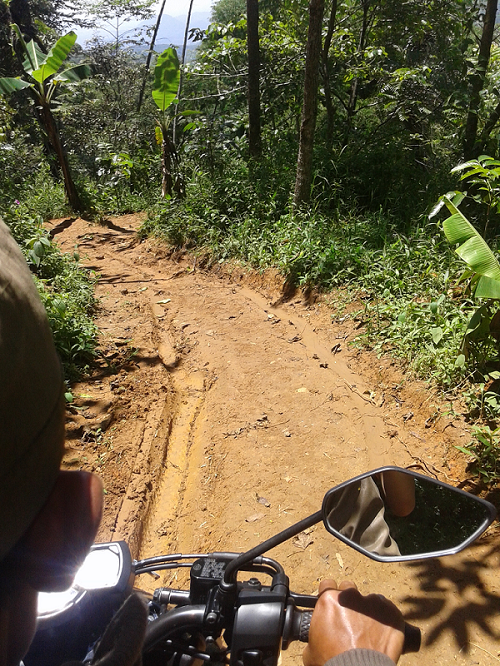 This final leg of the journey takes you on a winding mountain road, barely wider than the motorbike itself. The muddy road treks up steep hills, across rickety bamboo bridges, and dangerously close to rocky ravines. Along this path, you can see parts of the pyramid where the soil has washed away. The pyramid rocks are easily distinguished by their size, shape and color, which will be similar to the unearthed part of the pyramid that you will see at the peak. There are parts along this road where you can see entire sections of wall or “steps” which are also part of the pyramid. 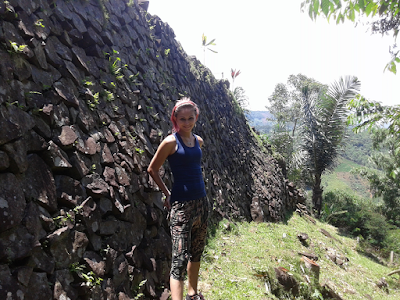 The first glimpse of Gunung Padang: The top terrace of the pyramid. After the long and arduous journey, it was somewhat surprising to see that there were quite a few people at the site. I guess they took the blue road. Most of the visitors to the site seemed to be students, likely on a field trip. The peak of the Gunung Padang Pyramid. At the top of the pyramid, several sections of the standing stones are cordoned off. I should assume, this is where they are “studying,” while they decide what excuse to give for the halted excavation. Visitors are also warned not to stand on top of or eat rice on the megaliths. This top tier is one of 5 terraces that are said to make up the pyramid. The pyramid also consists of a network of chambers, courtyards, stairways and gateways, most of which are inaccessible to the public. 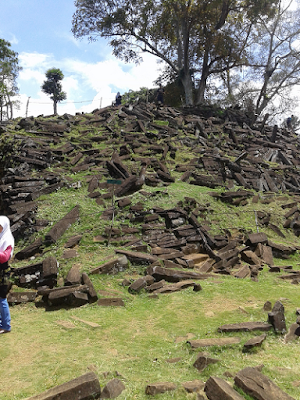 The partially excavated Terrace 2 of Gunung Padang Pyramid. The few pictures you see in this post are pretty much the extent of what has been excavated. I can only hope that the excavation will continue, and on that day, I will return again.